The Duke and Duchess of Cambridge embarked on a mini-tour of Cornwall this morning, and Kate's daytime jewelry uniform -- Kiki earrings, Cartier watch, wedding/engagement/eternity rings -- was on full display. 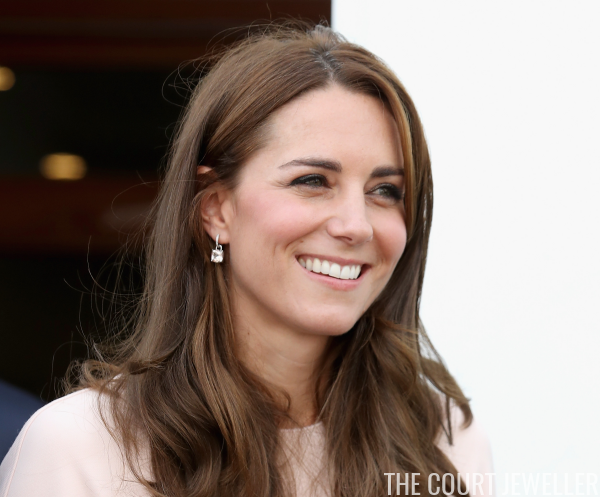 The earrings Kate wore for her morning engagements were the gold and diamond hoops with detachable morganite drops. It's tough to see in some images, but the morganites are a very, very pale shade of pink. Kate echoed the pink with a new dress from Lela Rose. I'm already anticipating your jewelry responses, because I expect that many of you are as weary of the uniform as I'm becoming, but I'll leave you with two thoughts. Number one: wouldn't the daytime uniform be SO much more exciting if it included a brooch, QEII-style? And number two: don't complain too much -- she could be wearing the leaf earrings again!